Moving their legacy application out of Lotus Notes and redevelop it in SharePoint. This would not only remove the costs and risks associated with the legacy system but leverage on the investment they had already made in Office365. Cost Effective : To replace any legacy system the replacement should not include functionality that, although nice to have, would create budgeting issues. We also went with a fixed price contract which set a price expectation for the delivery of the solution. Simple to use : The worst thing to do when replacing a legacy system is to unleash an unweildy beast of a system that no one wants to use. New features are great when they add to the efficiency and ease of use but not when they create barriers to use. Easy to manage : Most applications has users and administrators. STARS (Staff Tickets and Request System) was no exception. It had to be as attractive for the admins as it was for the rest of staff to excite them and help efficiencies in the processing of requests. Engagement of your workforce is key to improving the way you do buisness. Showing you are willing to invest in better tools to support a staff members roles shows and investment in their ability to do their job well. Removing redundancy. Taking away the need to support technology that isn’t in the future roadmap helps IT departments focus on architecting a technology roadmap for the future. Binds to older technology often stifles progress and removing this redundancy in turn removes these binds. The Application being hosted within SharePoint online allows the freedom to make changes to cater for larger storage needs and even a faster server environment if required without needing to peform any of that work in house. One security model and single sign on. Only having to set permissions within SharePoint that is already required for the intranet and single sign on for all staff enables ease of use and quick access to the STARS Application. Instand access to staff of their remaining yearly ticket allocation by simply going to the application page. 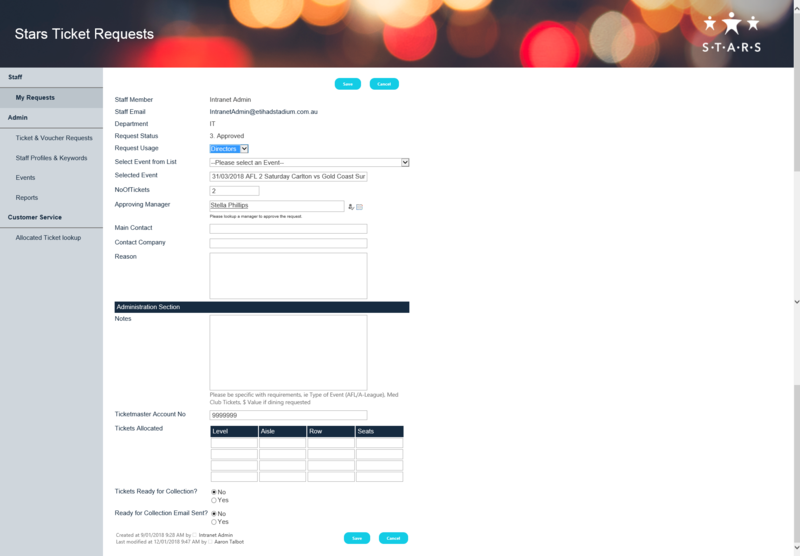 Instant reporting on tickets allocated for managers and also any requests awaiting their approval by mearly going to the managers page within STARS. Revoved the need to have staff that has skills and knowledge of the legacy system just because you are stuck with that technology. 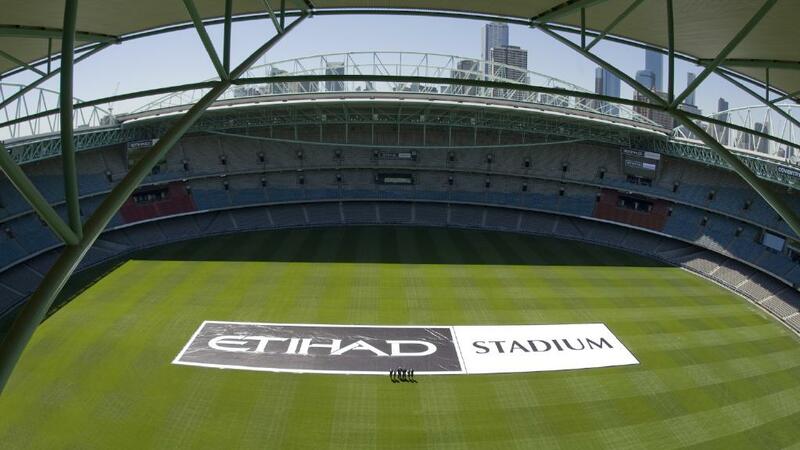 "We engaged Primaxis to enhance our SharePoint Intranet and provide greater uptake from Etihad Stadium staff. Primaxis kept us informed as the project continued and were always quick to respond when we wanted changes and additions.. The end result looks fantastic and has proven popular with staff and management"
Who is Melbourne Stadium Ltd? 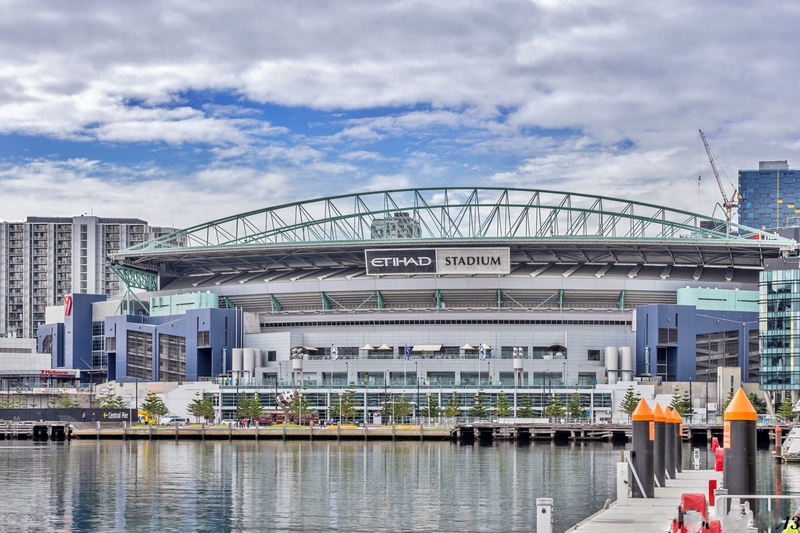 Melbourne Stadiums Ltd (Etihad Stadium) Location: Melbourne Victoria Industry: Events and Sport Melbourne Stadiums Limited (MSL) manages Melbourne’s premier sports and entertainment venue, Etihad Stadium. Most applications has users and administrators. STARS was no exception. It had to be as attractive for the admins as it was for the rest of staff to excite them and help efficiencies in the processing of requests. This benefits MSL in two ways, 1) frees staff up to take on other initiatives or just be more effective at the work they have and 2) real cost benefits in the reduced overhead for administering this application.